Young governess Jane Spencer is travelling to London when stormy weather forces her stagecoach to make a stop. Battling through the snow to a nearby inn, she discovers a man, seemingly lifeless, by the side of the road. Though he appears to have been set upon by highwayman, they have left next to him in the ditch a clearly valuable jewelled snuff box. When the man recovers his senses, he is dismayed to find he has completely lost his memory. Who was the enigmatic man? Why did he disappear? 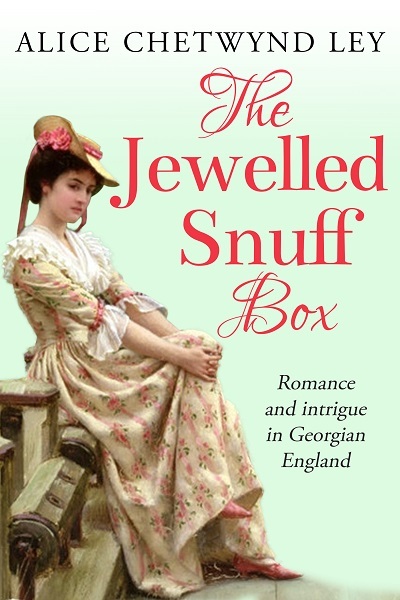 And what secrets are hidden inside the mysterious jewelled snuff box…? The Jewelled Snuff Box is the first novel by Alice Chetwynd Ley: a Georgian historical romance novel with a twist of suspense and mystery.